NORTHERN Ireland’s health and social care trusts are failing to meet a key target to increase the number of people being diagnosed with dementia. Amid concerns that individuals with the condition are going undetected and untreated, the trusts have failed to reach the desired 75 per cent diagnosis rate since the target was introduced in 2014, according to the latest figures compiled by the Alzheimer's Society. Three of the five health trusts saw increases in the percentage of people to receive a dementia diagnosis in 2015 compared to the previous year, but experts claim it is still not good enough. The target was described as a “key objective” of a group established to oversee the implementation of the Assembly’s landmark strategy for dementia care - Improving Dementia Services in Northern Ireland – which launched in 2011. Cancelling a review of memory services by the Regulation and Quality Improvement Authority (RQIA) despite this being planned for in the dementia strategy. The Department of Health, as well as the Health and Social Care Board, blamed any delays in implementing the strategy on a “lack of resources at that time”. They said it was later established that a specialist memory service would not be “economically viable” and the services will instead be evaluated once the new guidance for GPs is operational. Click here to read their comments in full. It is understood the guidance will focus on plans for GPs to take on more of a role in diagnosing dementia patients without the need for a referral to a memory clinic. But this comes after a recent report by The Detail which found that one in six dementia patients in Northern Ireland had not been reviewed by their GP for over a year. Dementia is an umbrella term to describe a range of symptoms, including memory loss, confusion, and difficulties with speech and understanding. It is a progressive illness caused by diseases in the brain. The most common are Alzheimer's disease, Vascular dementia and dementia with Lewy bodies. It does not only affect people over 65 but it is more prevalent among that age group. Dementia has been described as one of the biggest challenges facing society today due to an ageing population, and there are more than 20,000 people estimated to be living with the condition in Northern Ireland. Bernadine McCrory is operations director for the Alzheimer's Society in Northern Ireland. 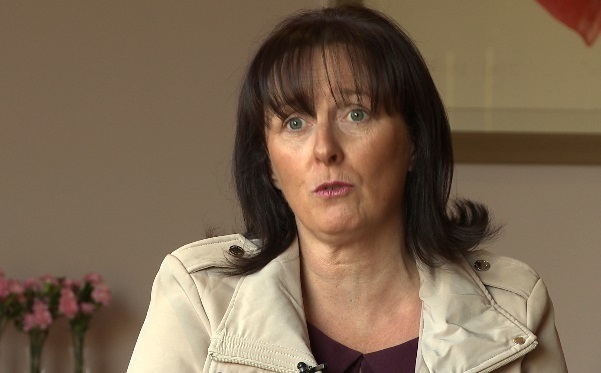 Bernadine McCrory, operations director for Alzheimer’s Society in Northern Ireland, said: “It is worrying to see diagnosis rates have stalled. 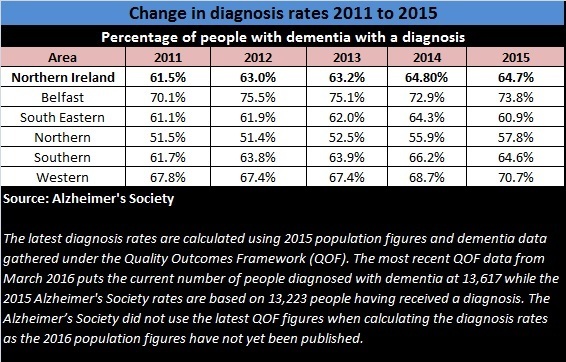 Northern Ireland has been leading the way with diagnosis rates and Alzheimer’s Society does not want complacency to set in. Click here to read more from the Alzheimer’s Society on the importance of diagnosis. The objective of achieving a 75 per cent diagnosis rate across all areas in Northern Ireland was set by the regional Dementia Strategy Implementation Group (DSIG) which was established to fulfill the aims of the dementia strategy, led by the Health and Social Care Board and the Public Health Agency. In May 2014 the group wrote to all Integrated Care Partnerships - which are networks of care providers including health professionals and voluntary groups - to outline the aim. The target was never publicly announced but was revealed in a letter obtained by The Detail under Freedom of Information legislation. The latest dementia diagnosis figures, which were compiled by the Alzheimer’s Society, relate to 2015 and provide a breakdown by health and social care trust area. They have emerged after the charity recently published a new report on dementia ahead of Dementia Awareness Week earlier this month. Figures from the Alzheimer's Society and Health and Social Care Board show only one health trust has achieved a 75% diagnosis rate but failed to maintain this after it was described as a "key objective" by a group established to implement Stormont's dementia strategy. The Belfast Health and Social Care Trust is the only health body to achieve the 75 per cent rate since 2011 but this happened before it was made a target in 2014. It has not reached this level since then. International dementia expert Professor June Andrews questioned why the 75 per cent figure was chosen as it was not included in the 2011 dementia strategy. Professor Andrews, who was one of two external consultants for the creation of the Northern Ireland strategy, added: “A new strategy is needed because the situation has changed since the first one was written. It had even changed before it was published. The Detail asked all five health trusts to explain why they haven’t met the target and what they are doing to improve diagnosis rates in their area. The Northern, Belfast and South Eastern Trusts provided details of their ongoing work, while the other trusts highlighted their investment in memory services. Click here to read their responses. Northern Ireland has historically achieved better diagnosis rates than the rest of the UK and its average of 64.7 per cent in 2015 is higher than Wales’s average rate of 43.4 per cent during the same timeframe. The Northern Ireland average equates to 13,223 people out of an estimated 20,429 thought to be living with the condition in 2015. The Detail previously mapped out where people with dementia have been diagnosed which showed there is disparity in diagnosis here. Read more about concerns over government delays of a multi-million pound dementia fund here.